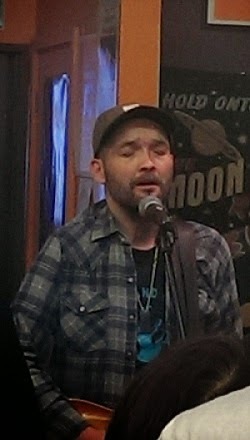 When Ben Watt explained the genesis of the title of his new solo album, Hendra, tracing it back through his half-sister’s house and road in Somerset to the old Cornish word ‘hendre’, meaning ‘home’ or ‘home farm’, I understood why the singer, guitarist, producer, DJ and record label-owner had just arrived from the Charleston Festival. Performing in Bexhill yesterday evening, his gift for telling stories, either through song or speech, was plain to hear. At Charleston, the East Sussex home of the Bloomsbury group, he had been reading from Romany and Tom, the written story of his parents’ lives. Having now added literature to his oeuvre, with two published books, the former Everything But The Girl musician has established himself as a true polymath. And the fact that the wonderful Music’s Not Dead record shop, already promoting gigs at Eras of Style and the De La Warr Pavilion in the town, had persuaded Ben Watt to do an in-store is testament to their importance to live music in Sussex. Arriving with a trio of guitars – “one of these is older than me” – and an amp, Watt treated the packed shop to an eight-song set, mostly drawn from Hendra. Having spent the past ten years immersed in the world of dance and electronica with his Buzzin’ Fly label, he is now on the more traditional ground of singer-songwriter and has been working with Bernard Butler and Dave Gilmour. Performing without a band, and experimenting with some open and interesting tunings, yesterday was a reminder of what a distinctive guitarist he is; and his plaintive voice perfectly suits his songs of grief and loss. His half-sister having inspired some of the album – he played the title track and The Levels, both dealing with the aftermath of her death – others, such as Golden Ratio, are inspired by the landscape. Although, Forget, which tells of walking on the Sussex Downs, was omitted due to its reliance on piano. Growing older and having to leave the past behind is clearly another preoccupation: the beautiful Bricks and Wood, which didn’t make it onto the album, tells the story of an impromptu visit that Watt and his half-brother made to the now-derelict family home; and Young Man’s Game – “one more chance to leave a mark” - is a paean to the limits of middle-age. But the past doesn’t get left behind entirely. Defining his new material as songs of experience, Watt also reached back to his songs of innocence. Two tracks from his last solo album, 1983’s North Marine Drive, were played with that distinctive jazz-folk guitar sound of his debut all those years ago: the title track - inspired by the Scarborough coastal road, and to a lesser extent, a residential street in Bridlington, Watt tells us - and set-closer, the gorgeous Some Things Don’t Matter – “this boy, caught up in the wheels of fate” – that is, perhaps, rather a song of prescience.